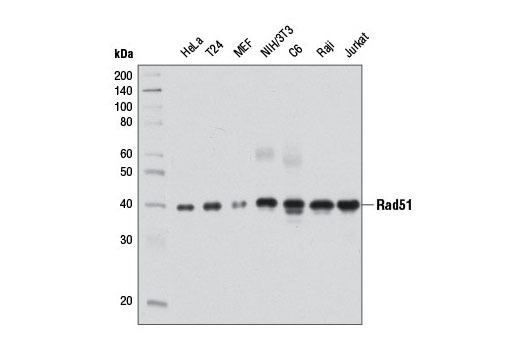 Western blot analysis of extracts from various cell lines using Rad51 (D4B10) Rabbit mAb. Immunoprecipitation of Rad51 from HeLa cell extracts using Rad51 (D4B10) Rabbit mAb (lane 2). Western blot detection was performed using the same antibody. Lane 1 is 10% input. 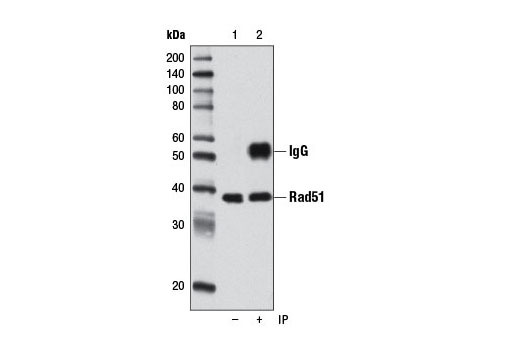 Rad51 (D4B10) Rabbit mAb recognizes endogenous levels of total Rad51 protein. Monoclonal antibody is produced by immunizing animals with recombinant protein specific to full-length human Rad51 protein. This antibody recognizes residues surrounding Leu140 of human Rad51. DNA double-strand breaks (DSBs) are potentially hazardous lesions that can be induced by ionizing radiation (IR), radiomimetic chemicals, or DNA replication inhibitors. Cells sense and repair DSBs via two distinct but partly overlapping signaling pathways, nonhomologous end joining (NHEJ) and homologous recombination (HR). Research studies have shown that defects in both pathways are associated with human disease, including cancer (reviewed in 1). DSBs that arise during S or G2 phase are repaired via homologous recombination (HR), using the replicated sister chromatid as a repair template. Rad51 recombinase, a eukaryotic homologue of E. coli RecA, polymerizes and forms a filament along single-stranded DNA, mediating HR with the help of auxiliary proteins, including Rad54 and BRCA2 (reviewed in 2,3). BRCA2 binds Rad51 and targets it to single-stranded DNA, allowing it to displace replication protein A (RPA) (4). Five Rad51 paralogs exist in vertebrates (XRCC2, XRCC3, Rad51B, Rad51C, and Rad51D) and they all appear to be required for efficient HR (5). Researchers have found that mutations in the Rad51 gene may be related to breast cancer risk (6). Some studies have implicated Rad51 as a potential marker for pancreatic cancer (7). Hartlerode, A.J. and Scully, R. (2009) Biochem J 423, 157-68. Sung, P. et al. (2003) J Biol Chem 278, 42729-32. Mazin, A.V. et al. (2010) DNA Repair (Amst) 9, 286-302. Jensen, R.B. et al. (2010) Nature 467, 678-83. Takata, M. et al. (2001) Mol Cell Biol 21, 2858-66. Antoniou, A.C. et al. (2007) Am J Hum Genet 81, 1186-200. Nagathihalli, N.S. and Nagaraju, G. (2011) Biochim Biophys Acta 1816, 209-18.